Thursday 5th May saw local and mayoral elections across much of the UK. 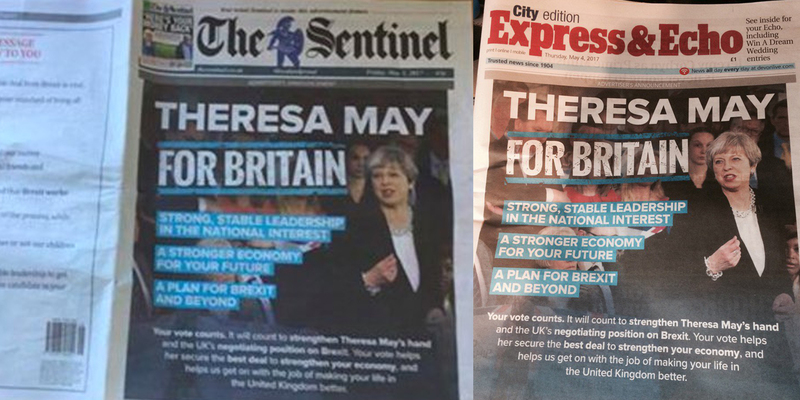 The Conservative Party, seeking to communicate with people in the areas of the country that were heading to the polls as to why they should consider voting for the Tories, ran cover wrap advertisements in local newspapers in the relevant areas of the country. This is perfectly legal: there is nothing in electoral law which regulates political advertising in newspapers. The advertisements themselves were not controversial or misleading and were for the national brand, not the local candidates, so were compliant with regulation around spending limits. The advertisements were clearly labelled as advertisements and there was no attempt to make them look like part of the newspapers editorial. The publishers of the newspapers didn’t modify the specifications for the advertising space to make it look like an endorsement. Given all this is the case it’s slightly bemusing that many journalists are kicking up a stink about it. Given that Buzzfeed’s whole business model is based on ‘native advertising’ (online advertorials) and the Telegraph newspaper is a regular purveyor of the cover wrap advertising format, it would be understandable if the campaign team at CCHQ felt a little hard done by. Journalists such as these should know intimately the sensitivities and regulations about such forms of advertising. This attempt to make perfectly legitimate political communication seem in some way tawdry or unfair is a bit ridiculous and borders on being contemptuous of free speech. It’s interesting that journalists are very quick to defend their right to say what they want, when they want, but when a political party tries say something to voters – whilst also contributing to the coffers which keeps news organisations afloat – they get hot under the collar. Direct political communication between the electorate and those seeking their votes is a sacred thing; parties can’t and shouldn’t have to rely on journalists in order to communicate their message. As long as parties comply with relevant law and regulation, they should feel entitled – and indeed should be encouraged – to speak to voters using advertising.